Did you start running or a workout program, and then quit because it was hard to find the motivation on your own? There are times when running and working out is just easier when you have someone to do it with. Sometimes, finding that someone is difficult. With our group runs, you’re all set! And now you ask, “But, what if I’m the slowest?” Not a problem! All paces are welcome to join in our group runs! You are bound to find a “pace buddy.” Still concerned about keeping up? Invite others to come with you! With more people, we can accommodate more paces, and no one is left behind. All group runs are free and open to the public. Group runs happen rain or shine, but will be canceled in the event of lightning, ice, or other severe weather conditions. Follow us on Facebook, Twitter, Instagram, or Snapchat for the latest information concerning group runs. The Grit Group Run is an easy out-and-back 6 mile course so you can go as far or as short as you like! The Grit Group run is held on Thursdays at 6pm. All abilities welcome and encouraged, walkers, runners, dogs and strollers! The course crosses a few busy intersections, so we ask that you be extra cautious, obey traffic signals, and never assume a driver “sees” you. 3. Wear bright clothing OR use lights OR other visibility gear. 4. All dogs MUST be on a leash at all times. Please remember to sign waiver at the front table for your chance to win a $10 TGRC gift card. For more information, call 479-434-3571. In the event of inclement weather (lightning/heavy rain/high winds/tornadoes/hail/ice), the event will not be held. The third Thursday of the month means Third Thirsty Thursday! 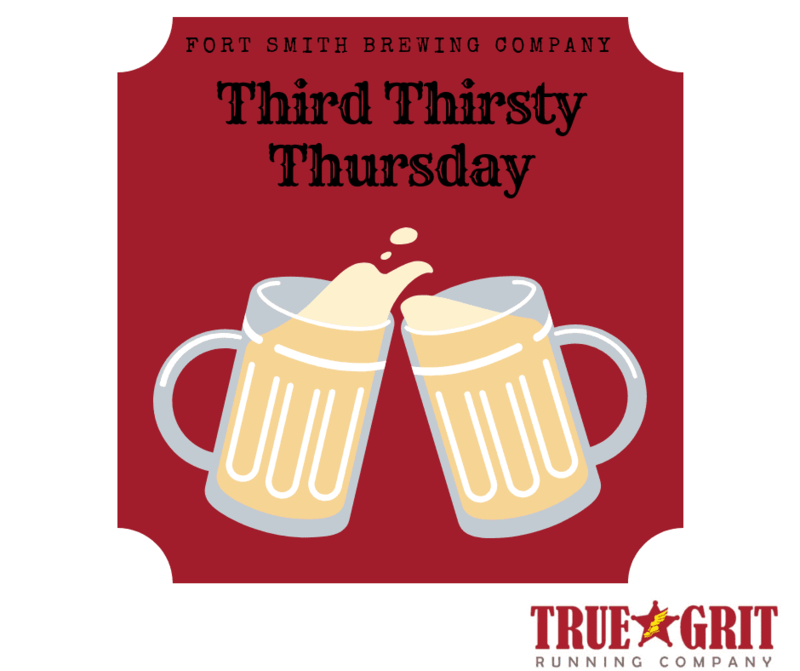 We meet at Fort Smith Brewing Company and begin our group run from there every third Thursday of the month at 6:00 pm! True Grit Running Company’s Half Marathon Training Program is designed to help you train for the Fort Smith Half Marathon, but it can be used to train for any spring half marathon. This program will focus on gaining endurance to help you complete a half marathon to the best of your ability. Participants are given a schedule and instruction on how to properly prepare for a half marathon. The program will include pacing, nutrition, hydration, for, and training principles, as well as other areas to help you have a successful race and find fun in the journey! The program includes monthly clinics (November – December – January – February) that will focus on various aspects of endurance running and serve as a Q&A session. Participants will meet every Saturday morning (weather permitting) between the start of the program and the Fort Smith 2019 Half Marathon (February 10, 2019). A supportive, fun, and diverse group will keep you motivated during the Saturday long runs. Participants may get their weekday miles in by joining GRIT Group Runs or fitting in training on their own. Participants MUST be at least 14 years old. Participants under the age of 18 MUST have parent/guardian sign the waiver and release.